Arduino enthusiasts or anyone that likes driving simulators may be interested in a new Arduino powered system which is being created by t EDN – Navàs, robotics students Rafart Jordi and Marc Thomas. 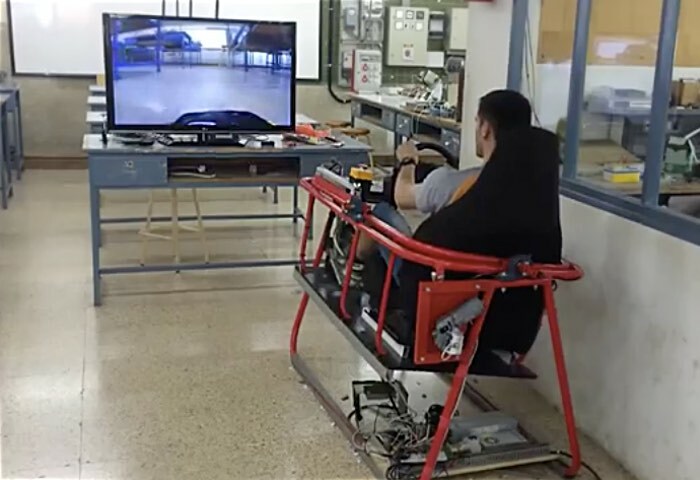 The Arduino car simulator has been created as part of their final project at t EDN and is capable of capturing video from a camera equipped remote-control vehicle which is then displayed on a large screen TV. The system makes it feel as though you are sitting behind the wheel of the smaller remote control car and is powered by an Arduino Uno along with an IBT-2 H-Bridge to control the 24V motors. Which wirelessly communicates with the modified RC car using an XBee module. Check out the video below to learn more about the Arduino car simulator and its construction. Arduino Car Simulator is the final project of Robotics and Industrial Automation CFGS students Rafart Jordi and Marc Thomas. This simulator is made by themselves and programmed with an Arduino UNO , using IBT -2 H- Bridge to control the Smokies Motors 24V .